Platter and Ramekins decorated with prawns as handles are earthenware, slip-cast, and is a table setting for seafood. The platter is flat with a wide fluted band around the edge, with two central depressions resembling scallop shells for holding dips etc. There are two large prawns in relief on the edge of the dish as handles and these are painted in red and brown against a white glazed background. 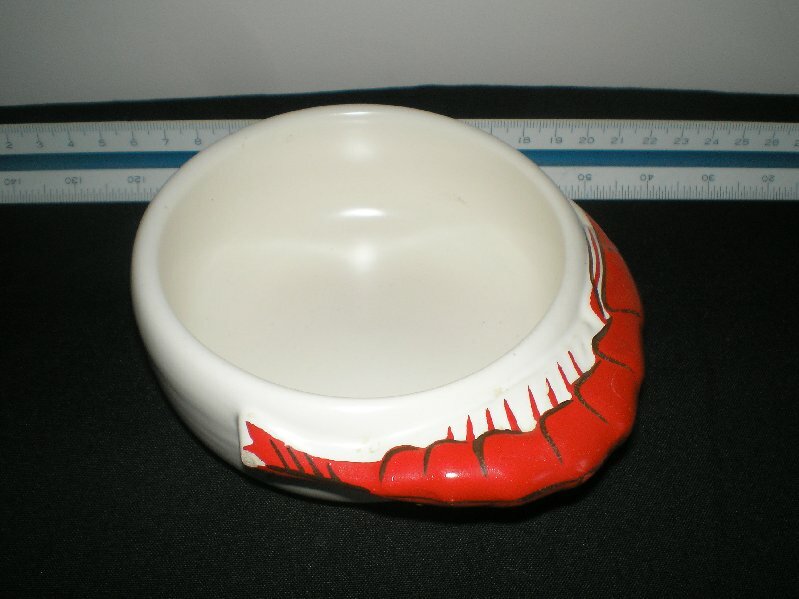 The set of four ramekins each have circular bowls with low rounded sides and are matt white glazed, each has a handle in the form of a prawn in relief on one side and may originally have been painted in red and brown. So far, I only have one with painted handles. Any paint on the handles of the set has long gone, although I believe that these were never painted. Small plates in harlequin colours with a similar prawn handle are also around. Ramekins, Willow Court Antiques, New Norfolk Tasmania. Check out the Diana website for lots more?